How’s organizing going for you? 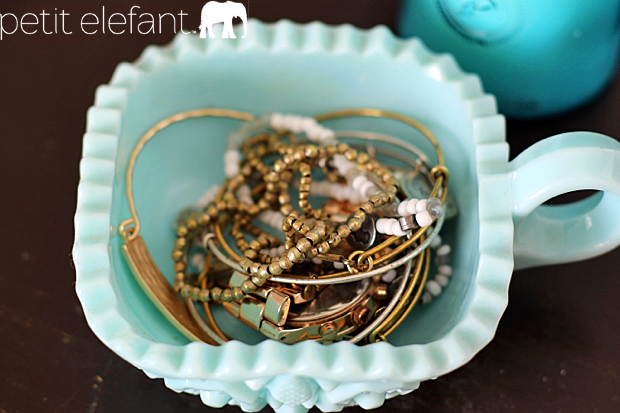 Have you been following along with my Organizing Your House One Week At A Time series? 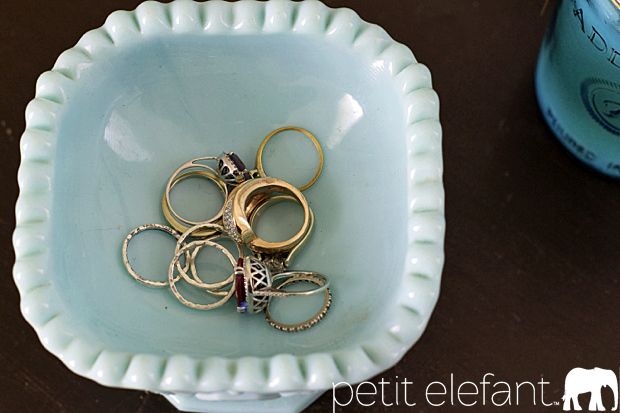 If you’re just getting caught up, here’s the skinny: I’m organizing my house one week at a time and documenting it on Petit Elefant. That way we can all get organized together, in bite sized chunks. It’s super doable and to play along you don’t need anything more than time. Really. We can totally do this. 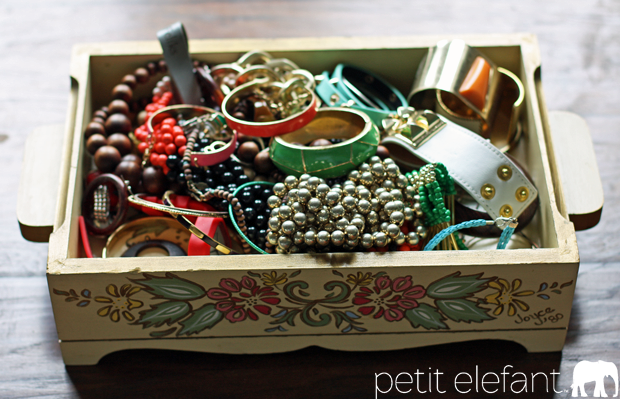 This week we’re going to organize your jewelry box. It’s going to be so much fun, just you wait. One of the tougher spots in organizing my bedroom, beyond having a really honest conversation with myself about what books I’m really going to read and which need to be donated to charity, is my jewelry box. 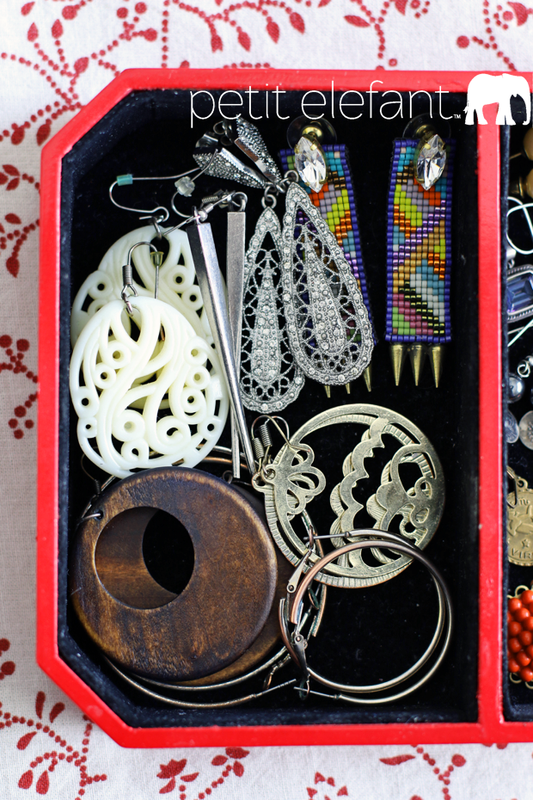 Or rather, my hugely out-of-control collection of accessories that don’t quite fit in one place. Do you think I like turquoise? AHEM. It’s a problem. For reals. 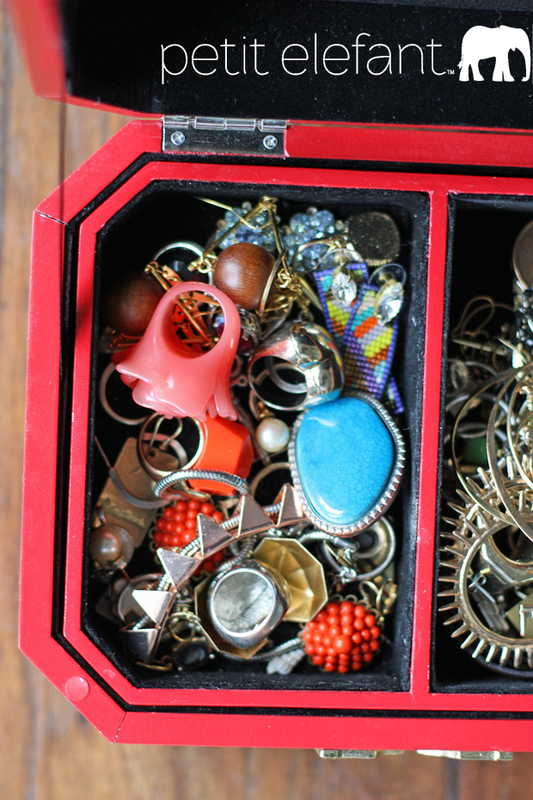 I’m a big on accessories, so I’ve amassed a huge collection of cheap (+ less cheap) trinkets. But I’m done with clutter in every part of my life, so it’s time to say buh-bye. I won’t lie, when I pulled out all the jewelry from alllll the random places and spread it all out to evaluate, it covered the entire floor of my study. Help me, Rhonda. 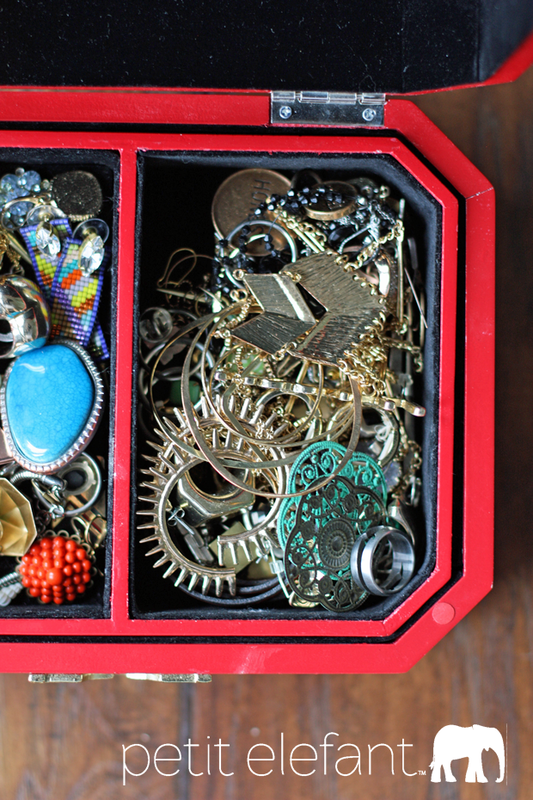 I was in pretty heavy denial about how much jewelry I had actually amassed over the years, because there were at least 5 different stashes of random necklaces and rings and whatnot spread/stored all over my bedroom and bathroom. Guys, that’s what we call a problem. Denial is real. What jewelry have I actually worn? Once? More than once? What has serious sentimental value? What jewelry will I actually wear again? What jewelry did I not even know I had? 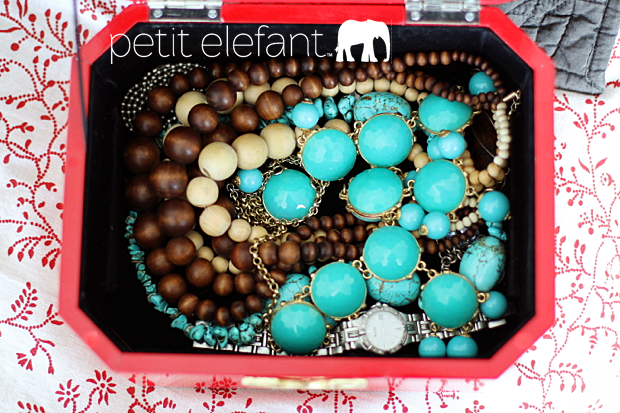 This is the sentimental + major life event jewelry pile. Engagement ring, great grandmother’s engagement ring, anniversary wedding band, Valentine’s Day present, Christmas gifts. These aren’t going anywhere. 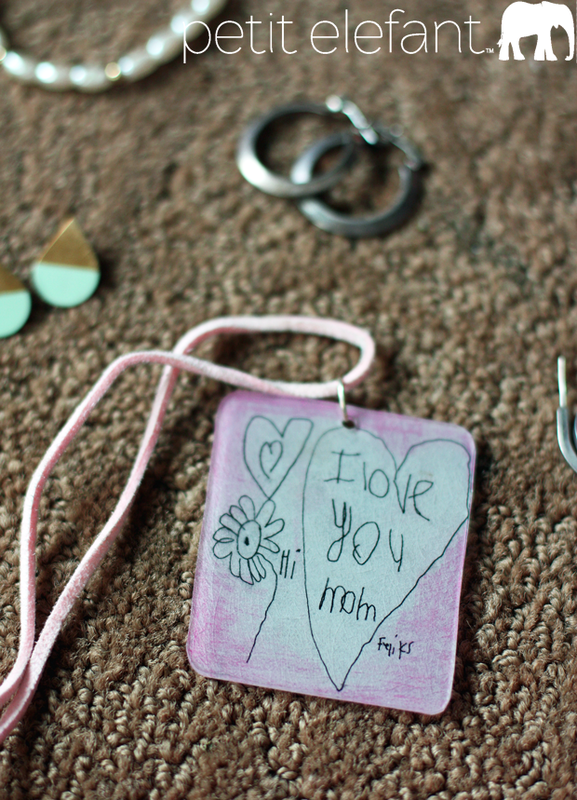 Ditto that for homemade Mother’s Day shrinky-dink jewelry from the babes. But this pile? This pile is out of control. So I sorted and sorted and sorted and found there was very little jewelry that fit into the categories of things I’m going to keep: sentimental value, actual value, things I love and plan to wear again. The cleaning and tidying part is the least fun for me. 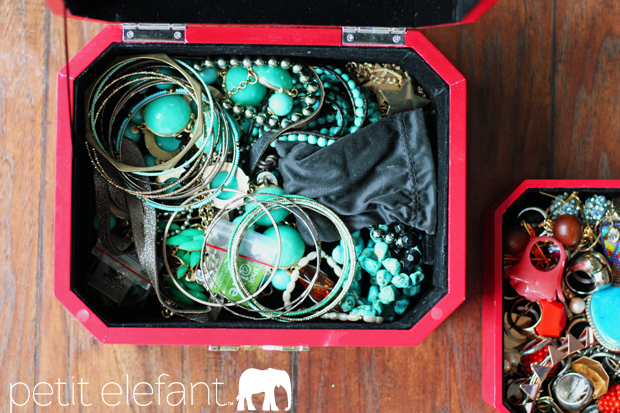 Thankfully organizing and tidying jewelry isn’t that big of a deal. I cleaned out the jewelry box, vacuumed, dusted, and wiped down and that was it. The second and third jewelry boxes went in the donate pile. Putting it back is the most satisfying step of all! You get to make everything nice and orderly and see the fruits of your organizing labor! Best. ever. Put things back in an orderly way so the organized stuff looks visually appealing to you. This is where your eyes can take a break and rest. Color coordinate, sort by size, whatever you like to look at. 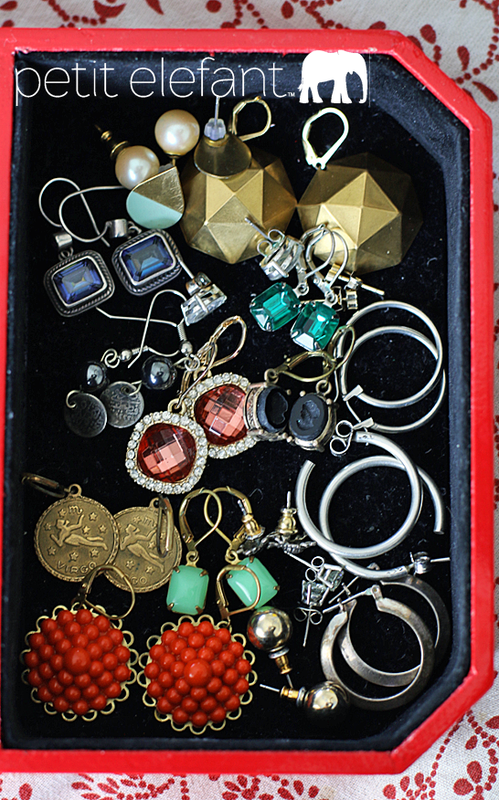 I organized my jewelry with big earrings on one side, smaller day-to-day wear earrings on the other, and big necklaces underneath the pull-out jewelry box divider. 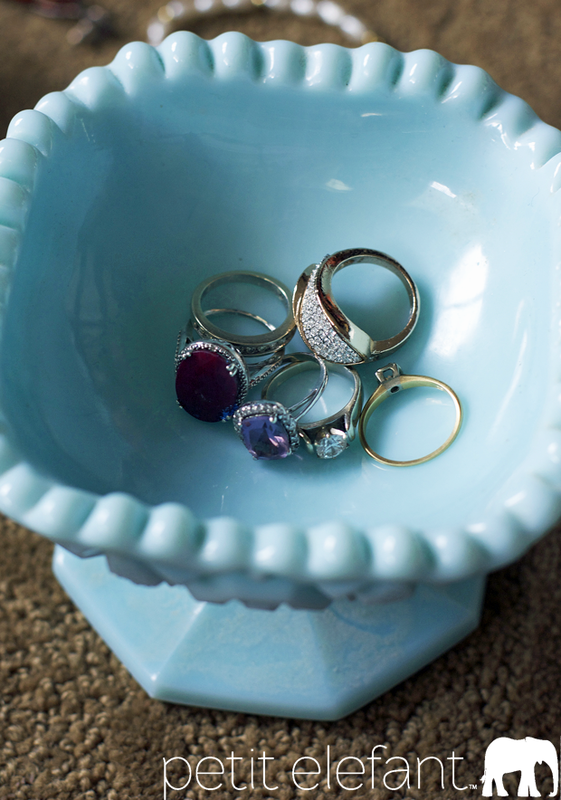 Rings and bracelets each went back into the separate antique milk glass bowls I’d previously used to store jewelry, and back onto the top of my dresser. Remember those piles you made when you were sorting? (see Step 2) Now’s the time to actually donate or toss. Be brutal. Remember my organizing motto: what would you pay to ship across the world if you were moving next week? Probably not a lot. 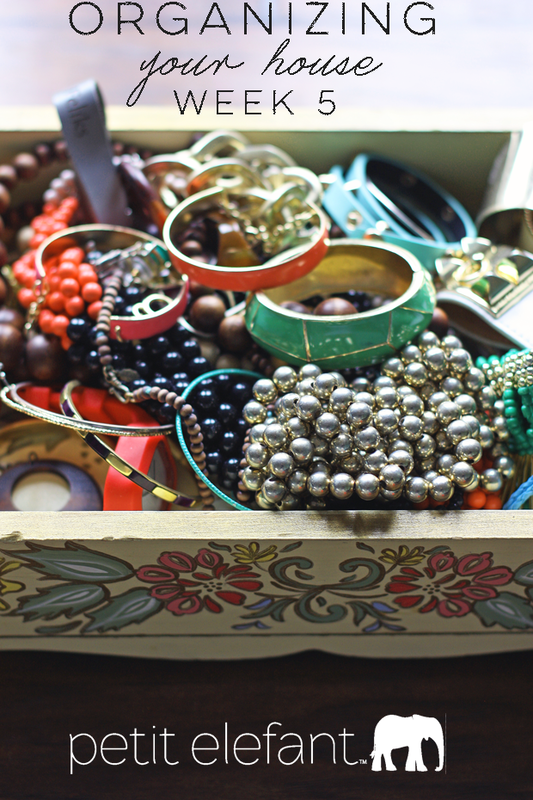 Jewelry is a bit trickier than donating used water bottles or books, but find a way to give it away that won’t make you cry yourself to sleep at night. I gave all my favorite jewelry to a dear friend and the rest went to the charity donation pile. That’s it, you’re done! Good for you. Don’t you feel better already? I’ll take your recycle/donate/toss pile! ;) Just kidding. I love purging and organizing. Just did my kitchen today! I love that you did your kitchen, good girl! The kitchen is next on the list, it’s driving me crazy!